Can you believe that the creation above is 28 Day Reset friendly? Amazingness coming right up…RIGHT NOW! If you feel like your tastebuds are getting bored on the 28 day Reset, I’ve got something that will excite them again! Today I was experimenting in the kitchen and I created hash browns from cauliflower and eggs! And it tasted EPIC. So I need you to go either buy yourself a bag of cauliflower rice right now or buy a head of cauli and food process it up into mini bits (aka cauli rice). 28 DAY RESET SUPER HASH BROWNS! 3 eggs for hash brown batter + 5 eggs for the 5 servings. 8 eggs total. #1. First heat up your pan or wok and put about 1 tsp of olive oil in the pan as it heats up on high. Then pour in the riced cauli and stir around for a few minutes until slightly golden. You don’t want to do this for too long because the cauli will eventually go back on the pan again and have another chance to cook through. #4. Now make your Avocado Mash. It’s basically 2 avocados, mashed with a fork with 1/2 a lemon and some salt and pepper to taste. #5. Now it’s layering time! Put the Avo mash on the hash brown, cook an egg sunny side up and top with some chili flakes and tomatoes if you desire! MMMMMMmmmmMMMMMmmMMMm! Doesn’t that look so good!??? Yeah. Had to GIF it. Because I want to relive this moment forever. How are you guys doing on the 28 Day Reset Challenge? Have you seen changes yet? I’ve talked to some POPsters and so far I’ve heard that the first thing everyone notices is better skin! I also saw that someone already went down 6 lbs in the first week! That is all awesome! And if in case you have not seen or felt changes yet, keep going. It takes time. It’s not easy but it will serve you so well in the long run to know your body’s food intolerances and sensitivities. If you want to join on the 28 Day Reset Challenge, download the FREE PDF here. And if you want the entire meal plan and recipe cookbook of Reset-friendly meals, you can check out my official ebook here. Let me know below in the comments how you’re doing. Be honest! Even if you’ve fallen off, it’s ok! Just get back on the wagon!! How much calorie in one serving? It was delicious! I ended up with 7 servings…so leftovers! I tried this and it was so good! I added a little garlic powder, chili powder, and paprika to the avocado for an extra kick! I’m going to try this so hard. My friend even Says this makes a perfect pizzabase, Which means I’m serving pizza this easter. So I want to ask you sth. There are 5 things I have to omit, but what else can I eat? I don’t have any ideas, so I would be thankful if you make a meal plan or sth for the 28 reset challange. I’ve read everything on Piit.com, but u have to buy it and my parents don’t allow me to buy sth on the internet. Hey Cassey, do you have any healthy snacks I can make even though I live in Haiti. I would love to eat healthy, but my options are super limited. Any help? The 28 day reset is so awesome!! The first week I craved a lot, but know I don’t even feel the need to have cheese or sweets. I have dropped 10 lbs and my skin is definitely clearer. The only issue is that I live in Haiti and it is super hard to get healthy alternatives. But I am still dedicated. Thank you sooooo much, Cassey! Hi Cassey! I’ve been doing Blogilates since 2013 now, and am in love with these hash browns. However, my mom cannot eat any eggs and I would love to make this for her. Do you have any ideas for an alternative to hold the cauliflower together? Are we allowed dark chocolate? Hi Cassey! Do you know if you can freeze the hash browns once they’re cooked, as well as freezing left over avocado? I’ve been doing this and working out hard and I feel amazing and more importantly I am getting in shape to play Kala in Tarzan the Musical! This part is incredibly physically challenging (try walking around like a gorilla for 10 minutes. Just try) but I am so excited! Also, sending this to my husband so maybe we can have it this weekend. It looks SO GOOD. haha ok i will put my funny cap on! How many ounces is a Trader Joes bag of Cauli rice? The only TJ in town is a pain to get to and I’d like to try with a head of cauli, just wanna know roughly how much to make. Thanks! This looks AMAZING! I’ve been wanting to do the 28 Day Reset for a long time now, and I’m so glad I did. I’ve been pretty strict with following it, and I even purchased the PIIT 1.0 along with the recipe book. I only had one cheat, and that was a few cinnamon red hots that I got for Christmas (they are so so delicious….). But my skin has never looked better and it’s only been a week and a half! People have been asking me questions about why I’m suddenly eating 5 meals a day, but most people are supportive. I can’t wait to try this recipe! Are you planning on making a vegetarian style 28 day reset? I would love to do the reset but I am struggling with whether to buy the normal or the vegan. Vegan may be too much for me because I do still eat eggs and fish sometimes. I personally would recommend buying the vegan one–I took a chance and bought the non-vegan version as a pescetarian, and at least 60% of the snacks and meals involve meat. I haven’t really been able to use it beyond the general meal-planning guidelines, and they don’t permit returns. Best of luck with your reset! What would the ingredients be for a single serving? You have me drooling like crazy! So far so good. No nuts and no dairy. I’m dong keto paleo! Ive been completely dedicated to the 28 day reset and I have noticed a change in my body, skin and mood. I feel like I have more energy and Ive been getting out more. When I see my friends I bring some healthy snacks, I can tell they think its a little extreme but Ive been wanting to do this kind of thing for a long time so Im buckling down! My skin does look better, but Ive been embarrassingly gasy from all the raw vegetables. I have a hard time doing 6 meals a day with my schedule so I’ve been doing 3 larger meals which has been working. Sadly Ive been abusing stevia a little but im going to cut back as I go to reduce cravings for sweets. Good luck girls Im proud of you! I am so in love with the reset! I’m down 7 lbs already and I feel AHMAZING! Even my sweet cravings are almost nonexistent. This is exactly what I’ve been looking for and I am loving every minute of it. I’m not a fan of cooking, but the reset has gotten me so excited about prepping my meals. I’m inspiring all the people in my life with the reset I’m doing and have even got someone my coworkers to do it with me. Thanks so much Cassey and the entire blogilates team! omg that is incredible!!!! congrats!!! Thank you SOOOOO much! <3 <3 <3 I can't wait to try this Super Hash Brown recipe! Love you and your team so much! Every time I get an opportunity to talk about YOU, Pop Pilates and PIIT 28 to others, I get so excited! Would this recipe work with a flax egg? I would absolutely LOVE to try it if it’s vegan friendly!! Yes that would work I’m sure. This looks delicious! I’m on day 5 of the reset and I’m enjoying it. I’m already down 4 pounds but know some of that is water weight. I’m pleasantly surprised that I’m not craving carbs/ gluten as much as I thought and I love the eating 5 times a day (though I don’t love cooking 5 meals a day as much). I’m very excited for what this month is going to bring and so happy I’m changing my eating style for the better. I’m getting a lot of interest from friends and family when I send them pictures of the delicious food I’ve made too like the mexi cups. Once this month is over I plan to continue with these recipes, though I’m going to make larger batches/ repeat meals so I don’t have to cook as many different things for a week. Thanks for designing the 28 day reset! This looks amazing! 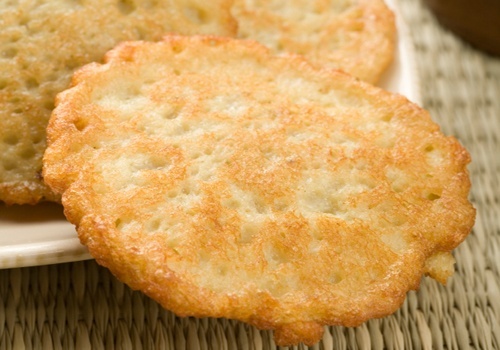 Do you think you could make several hashbrowns at once, freeze and reheat later? I’ve been following along 100% so far! I haven’t seen major improvements so far, but I’m going to stick with it for the full 28 days. I got my period at the same time, so my skin is a disaster regardless. I’m confident it will clear up next week though. :) And then I would just like to lose a little belly bloat by the end of it all. This looks delish! I bet it would be good to make the cauliflower hash brown in a waffle maker too! I’m doing wonderfully on the reset and PIIT. I’m shocked at how full I am because of these snacks. Definitely going to try to eat this way forever with the occasional indulgence after the reset. :) I am not noticing much of a skin difference, but I am about to get my period, and I haven’t been PMSing as much. I also haven’t gotten my monthly break-out from that either… So yayyyy!